Among the outstanding back-end units making its debut this season is Frank Hansen's Siberskoye (Siberian) Creature. It reportedly rolled up record grosses with the No. 1 unit of Bobby Cohn's West Coast Shows at the Portland (Ore.) Teen-Age Fair, with similar success at the Seattle and Omaha teen expositions. Kudos came from Don Burton, producer of the Portland event, who termed it "one of the cleanest and best conducted attractions we've ever had in our six years of producing fairs," and Joe Gunson internal auditor for the KOIL (Good Guys) Teen Creature drew 30 per cent of the approximate 58,000 attendance. Tab was 25 cents, 25 cents for kids. Bookings to date include the independent midways at the Heart of Illinois Fair, Peoria; Wisconsin State Fair, West Allis; Minnesota State Fair, St. Paul; Kansas State Fair, Hutchinson, and Oklahoma State Fair, Oklahoma City. A retired Air Fore pilot, Hansen entered show business last year with his "Mystery Machine" after it was returned to him from the Smithsonian Institution. He wound up at the Arizona State Fair in Phoenix, then moved to California to frame the new unit at an estimated cost of $50,000. The Creature is framed in a 40-ft. semi which can be folded up on the road in 45 minutes. Trailer has paneled walls, carpeted floors, individually-lighted, airline-type steps and watchman's quarters in front. Camper-type quarters are air-conditioned and carpeted, with shower, lavatory, refrigerator, stove, oven and self-contained water, waste and electric units. 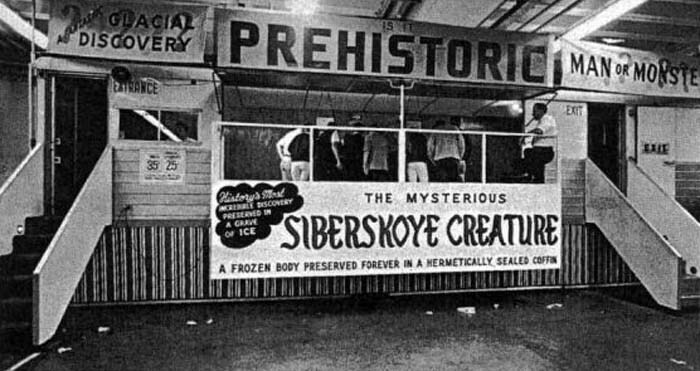 Exhibited in a specially-designed refrigerated coffin which maintains 10 below zero at all times, the "creature: is frozen in a 3,000-pound block of ice, clearly visible through a double thermo-glass top which prevents frosting and acts as a heat barrier. A portable electric generator supplies power on the road and for emergency use on location.